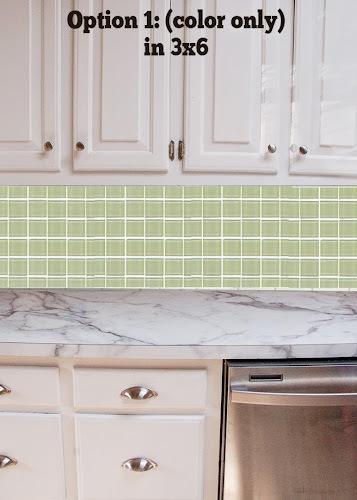 I wanted to wait until the counters were installed to pick the backsplash tile, because I'm slower than molasses when it comes to making decisions for myself. If this kitchen belonged to anyone else, I would have picked everything at once and it would have been done a year ago... but that's because I'm sort of bossy and (not so) secretly enjoy making decisions for other people. Ha! I have it narrowed down to three options. I'm all about options. Thanks to the magic of computers and my limited skills, I threw three images of my kitchen together with samples of the colors. Pretend these tiles are 3x6. This is what I'm leaning toward because I think they're so darn pretty. And I think they're different enough from my Formica counters that there wouldn't be an issue of the real marble making the fake look cheap. This green marble tile also reminds me a little of this kitchen's beautiful crackled ceramic tile, and I've always loved this kitchen. A classic choice. Would make for a very white kitchen, though.. So, what do you think? Does anyone have any words of advice for me? 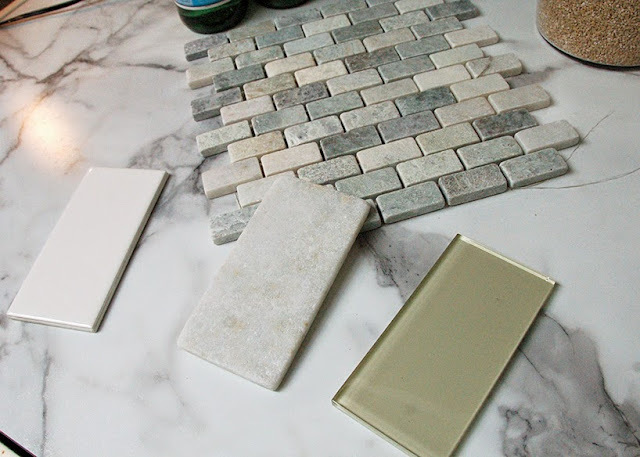 Let's pick some tile! Great options - such a tough choice! 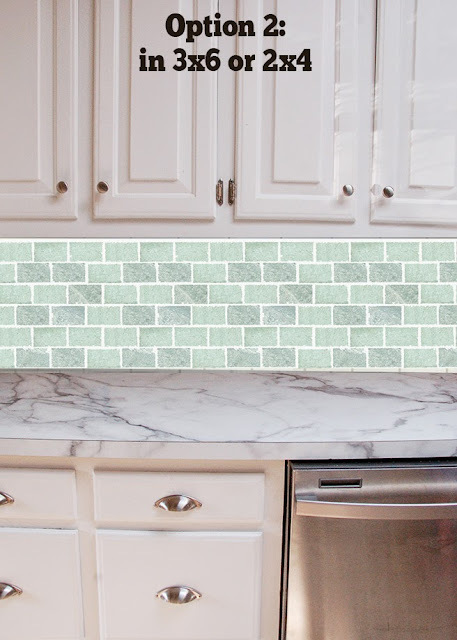 I lean more toward the plain subway tiles, but I'm also not very good at visualizing mixed patterns (like the mosiac with the marble). I need to see everything installed and complete before I can make my mind up which is obviously a problem, haha. No matter what you decide, it will be lovely! 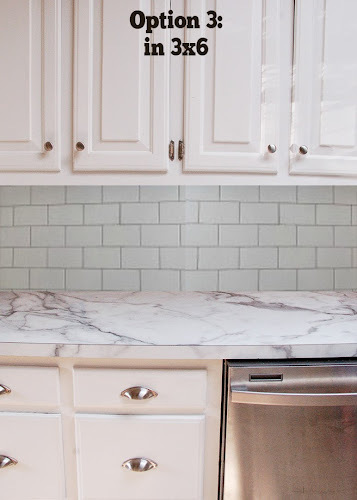 Your kitchen is full of classic elements! All great choices. Exactly the ones I would have chosen. I like color variety a lot so I would choose the green marble tile. Choices are also not quick for me for such a permanent thing so, I would have to bring a box home and prop them up around where I could, to live with it a week or so before making my decision. Good Luck! Your kitchen looks awesome now. Just found you through pinterest this morning. Thanks, Tracey! So glad you stumbled across my little blog! #2 is beautiful! Well worth the wait. Where are they from? 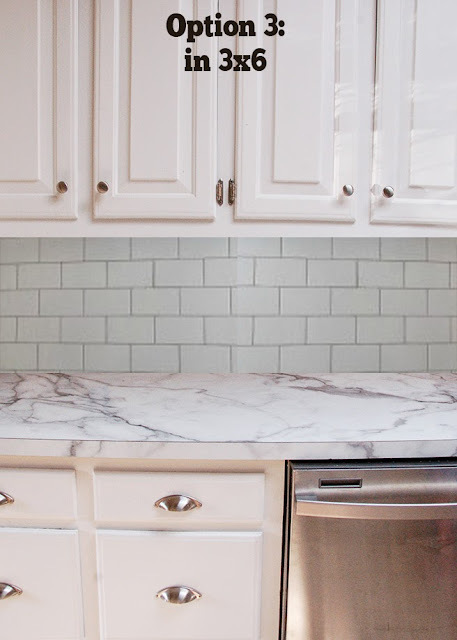 I'm also a fan of the white subway tile. So classic! The kitchen is looking great!! I actually like the green marble. The color variation is gorgeous, and the texture really warms things up. While the glass tiles are pretty, I think they would end up looking too 'flat' in a space that is already full of flat expanses of space. If you choose option #2, everyday will feel like a new kitchen. 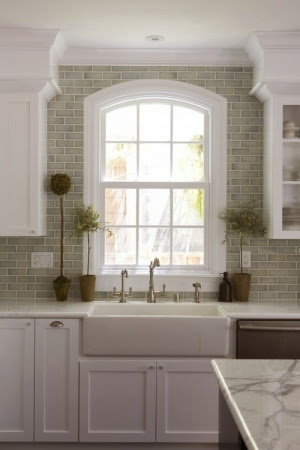 Such a very hard choice but I think I have to go with the white subway tile, I guess I'm just a classic girl at heart! ;-) Whatever you choose will be gorgeous. Love option 2, the green marble! So beautiful. Option 2 in 3x6; a smaller size would look a little "busy", in my opinion, and the larger size would look more like the kitchen photo that you love. The colors are beautiful! Love option 2 the most- that inspiration pic makes it! 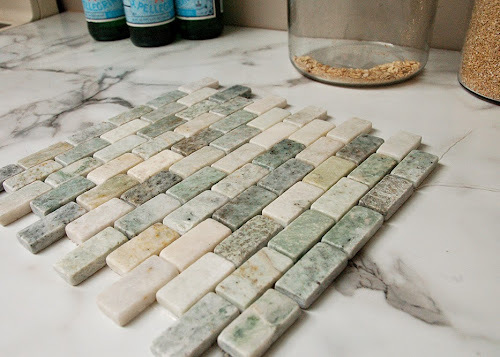 Any chance of finding out where the mosaic tile is from? It's beautiful.